My previous post mentioned the error when measuring for the backing for a Linus Quilt, Scrappy Trip Around the World. I was "shy" about 1.5 inches in width, and 4 inches in length. I didn't have any more of any of the fabric in those squares. 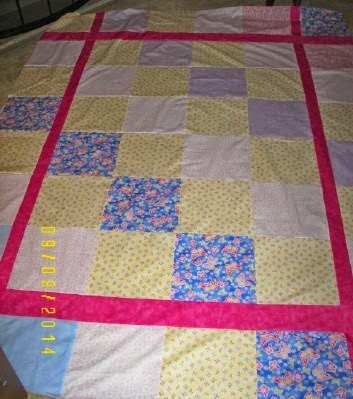 Luckily, none of the 10 inch squares were sewn together, and I HAD this bright pink. I was not thrilled with those pale, pastel fabrics. I was so pleased with this solution that both DH and I agreed it could be used as a "real" quilt top, but NO, it will be the backing. The pink jazzed it up, and improved the entire coloring, as well as solved my measurement problems. What a perfect example of errors turning out better than the original! It actually IS a 2-sided quilt! I tend to be not fearful of errors because of the great pleasure in getting out of trouble! Famous last words when finishing a quilt (or a backing), "It turned out better than I thought it would." Wow, that looks really zippy! and the front of the Linus quilt is really cute, too. They were made for each other!